The Friday Fairy. Illustration by Emily Parkinson. This past winter, freshly baked challahs began appearing, seemingly out of thin air, on doorsteps around the country. 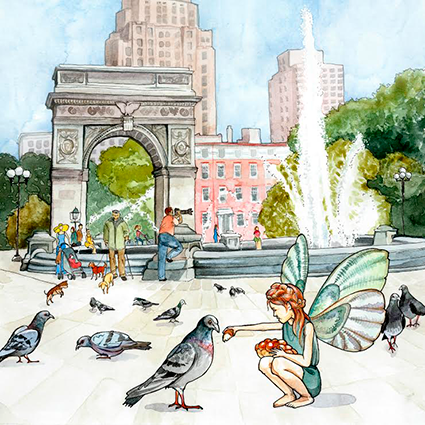 The loaves were accompanied by illustrated cards depicting a winsome sprite feeding scraps of challah to the birds in New York City’s Washington Square Park (top) or riding on a bicycle’s handlebars as it traversed the Golden Gate Bridge in San Francisco. Instagram lit up with the hashtag #fridayfairy, and a new Jewish tradition was born. It didn’t hurt that the loaves being delivered came from leading Jewish chefs like Philadelphia’s Michael Solomonov, who contributed za’atar-feta challahs, and renowned bakeries, including Zucker in New York and Bread Lounge in Los Angeles. The challah initiative aimed to draw attention to Shabbat and its centrality to the story of Jewish food—and to create buzz for a new Jewish food endeavor (more on that later). ​The Friday Fairy—she still visits patrons from time to time, read more about her at on the society’s blog—may not be a real person, but the woman who created her is. Naama Shefi, an Israeli transplant living in New York City’s Lower East Side, has been at the heart of everything Jewish + food + cool for almost 15 years. 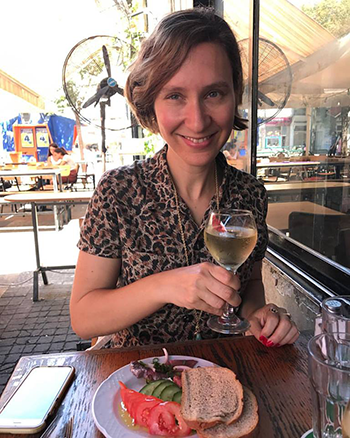 ​I first met Shefi, 38, when she was working at the Israeli Consulate in New York, organizing events including Passover seders and mini food festivals. But it was after she left her posting there that things got really interesting for her. ​First there was a series of lectures at the Center for Jewish History in New York City where Shefi, like a culinary Gertrude Stein, gathered food scholars and writers to dissect subjects such as the history of brisket. Next came a 2013 collaboration with Israeli-Danish baker Uri Scheft where live models were outfitted in couture dresses made of bread for a performance art exhibit at The Jewish Museum in Manhattan. Naama Shefi. Photo by Adeena Sussman. That same year she introduced The Kubbeh Project, a New York City pop-up restaurant where dozens of people feasted nightly on Kurdish semolina dumpling soup in a tiny East Village bakery. ​Shefi and her team are visiting homes and conducting interviews around the country to collect recipes and document stories. They also are holding events that celebrate the greater meaning of food in Jewish culture. 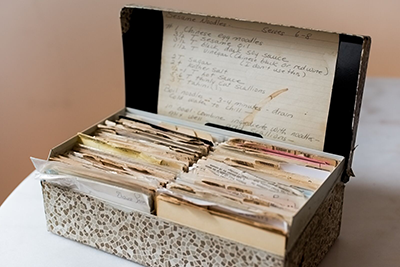 At Schmaltzy, a roving series of storytelling evenings that kicked off in Manhattan but is expanding nationwide, participants share the resonance of cherished recipes and the impact they’ve had on their lives. Raconteurs have included cookbook author Liz Alpern of The Gefilteria, Israeli-born New York chef Einat Admony of Balaboosta fame and Mitchell Davis, the James Beard Foundation executive vice president. ​“In addition to food there are always laughter and tears at Schmaltzy events,” said Shefi, who grew up on Kibbutz Givat Hashlosha near Petah Tikvah. The society’s website, still in development, will become a resource for oral histories and recipes that Shefi either seeks out or are submitted (you can do so here). ​Rosh Hashanah, which begins the evening of September 20, is a perfect time to start new food traditions, and here are three recipes that Shefi’s group has collected to get you started. This maple-infused challah, tzimmes and brisket are all Jewish classics with a twist, worthy of helping you usher in a prosperous new year. The challah’s maple element gives a sly nod to the tradition of drizzling honey over challah during the Jewish holidays (make sure to use only pure maple syrup). The brisket’s use of white wine is a delicious deviation from the usual hearty red. And the tzimmes is a roasted departure from the typical holiday side. Plus, each recipe includes a story. ​The challah comes from a three-ring binder cookbook, Tzimmes in Vermont, discovered in a library’s archive. Shefi’s staff tracked down the book’s co-creator, Barbara Stern, who told them that the recipe’s author was a Canadian Jew named Marvin Gamaroff who also donated the land for a synagogue in Stowe. 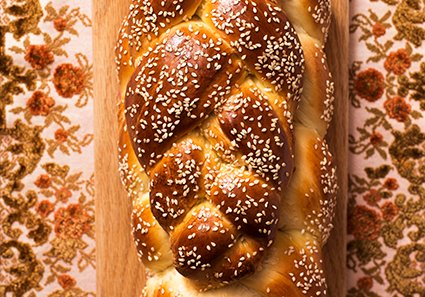 If you’re making the challah for Rosh Hashanah, try coiling or braiding the dough into a circle. ​The brisket recipe comes from food writer Devra Ferst’s family. As the story goes, her father, Walter, visited distant relatives in Sweden on a post-college trip and found himself at a table enjoying the same brisket his late grandmother had been making since before he could remember. 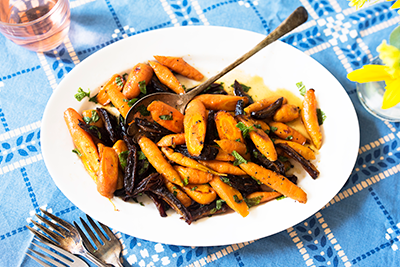 ​Sonya Sanford, a culinary television producer and writer living in Los Angeles, reworked her grandmother’s “mushy, sickly sweet” tzimmes by adding citrus, fresh ginger, pomegranate molasses and fresh herbs to roasted carrots. The resulting dish is bright and contemporary, as much a reflection of Sanford’s Ashkenazi roots as her California ones. 3. Turn the dough onto a lightly floured surface and knead until smooth and supple, 6-8 minutes. The dough can be slightly tacky, but not sticky. If the dough is sticky, lightly sprinkle 1 tablespoon of flour at a time into the dough and continue kneading until dough is no longer sticky. 5. Punch the dough down and, if making into a long loaf, divide into 4 equal pieces. (If making a round challah, fit the dough into a round pan for its last rise, either braided or rolled into a coiled rope of dough.) Roll 3 of the 4 pieces into long ropes, about 2 feet in length, thicker at the center and thinner at both ends. Braid the 3 long ropes and tuck the ends under to seal. The braid should be about 14 inches in length. 6. Take the fourth piece of dough and divide it into 3 equal pieces. Roll these out in the same way to about 16 inches in length and braid. This smaller braid should be about 12 inches long. 8. Preheat the oven to 350°. Beat the remaining egg and brush the challah liberally with the egg wash. Sprinkle sesame seeds over the challah and let rise again until it has doubled in volume, about 30 minutes. 9. Bake, rotating loaf after about 15 minutes, until the challah is brown, about 30 minutes. Remove from the oven and let cool completely before slicing. Serve the same day. Ferst family recipe box. Photo by Dave Katz. 1. Preheat the oven to 350°. Make small incisions in the brisket, and plug with cloves of garlic. Coat brisket generously with salt, pepper and paprika on both sides. 2. Using toothpicks, pin onion rings liberally to both sides of the meat. Place brisket in the center of a large roasting pan with remaining onions strewn around the meat. 3. Pour a mixture made up of two-thirds dry white wine and one-third water over the brisket to achieve 1 1/2 inches of liquid. 4. Cover the pan tightly with aluminum foil and cook for three hours. 5. Remove foil covering and continue to cook for approximately 45 minutes, basting with liquid every 10 minutes. 6. Let sit for at least 20 minutes before slicing. Serve with leftover juice from the pan. 1. Preheat the oven to 400°. Add the carrots, dates and ginger to a medium bowl. Pour the coconut oil over the carrot mixture and toss to evenly coat. Sprinkle the cumin, cardamom, salt and pepper over the mix, and toss to incorporate. 3. Remove the carrots and dates from the oven and transfer to a bowl. Add the remaining ingredients and toss to coat. Check for seasoning, then transfer to a platter and serve immediately.